Mandarine Ambrée, which features mandarin, passion fruit and amber, has a similar sparkling start as the Pamplemousse Rose, albeit with much less (but surely some) grapefruit. It's bright and cheerful, with a beautifully juicy and tart mandarin note that gradually gets fruitier, fuller and sweeter, and then slightly woody, with a sheer amber base and a slight dash of vanilla. It isn't heavy, and indeed it smells suspiciously like something that is bound to be fleeting, but it isn't — a few good sprays lasted for hours on me, and even the citrus and fruity notes linger far longer than you'd expect. Again like Pamplemousse Rose, Mandarine Ambrée is a cologne in the classic sense, in contrast to the more modern approach taken with Gentiane Blanche and Narcisse Bleu. Presumably, you know who you are and which you'll be likely to prefer, but I do think both are worth a shot. Verdict: I knew within 15 minutes that Narcisse Bleu was not for me, but I wasn't immediately sure about Mandarine Ambrée. As sometimes happens, it grew on me with subsequent wearings. I'd add it to my buy list if I needed another summer cologne from Hermès, or if they offered it in a (much) smaller size,3 but as it is I will probably do without it until I drain my bottle of Pamplemousse Rose, and maybe replace my almost-empty bottle of Osmanthe Yunnan. Thinking of Angie's recent post on Day to Night Perfume for Summer, Mandarine Ambrée would make a perfect daytime pair with Hermès L’Ambre des Merveilles for evening, and if my sample holds out, I might try layering it with some others in the Merveilles series — it could be that it would do nicely with Eau Claire. 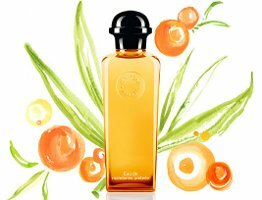 Hermès Eau de Mandarine Ambrée is available in 100 ($125) and 200 ($165) ml Eau de Toilette. 1. Both launched in 2009, and joined the older 1979 classic Eau d’Orange Verte. 2. That said, the opening of Narcisse Bleu is really quite stunning, and it's worth trying if only for the unusual take on bitter greenery in the first few minutes, which inspired Victoria at Bois de Jasmin to quote Monty Python's "we want a shrubbery". After that, it's a much milder experience, although the narcissus note is likewise quite nicely done. There's another positive review of Narcisse Bleu at Grain de Musc. If you'd like another take on the Mandarine Ambrée, check out Persolaise. 3. Hermès does frequently produce 15 ml travel sizes, sometimes as limited editions. If I come across one for Mandarine Ambrée, it will be mine. Hey, the Mugler definitely counts — another one of my favorites, and WAY cheaper than the Hermes, right? It can also be bought at discount for a song, in case your bottle ever runs out. Hey, now I’m confused…I didn’t think PR came in any format but Eau de Toilette? I’ve seen the EDP at NM, the bottle is frosted instead of clear (EDT). In my case, the EDT of EdPR is plenty strong enough. Relleric, thank you…honestly did not know (or had forgotten) there was an EdP. Jonr951: Usually EdC is a little lighter in concentration. And you are right…I thought the original was an EdT, but just looked at my bottle and it is EdC, and the clear bottle. So I think it was originally an EdC and later they did an EdT? I really don’t think it comes in an EdP, the frosted bottle is the EdT, but it would be interesting to compare all 3 if it did. Thanks Joe. I’ll have to see if my local H. boutique has it. Anyway, the EdC is strong enough for me! Hmmm, i was the opposite… the Narcisse Bleu went right to the highest places on my shopping list, while i didn´t care so much for the mandarine… although i admit is a very nicely done fragance, specially because the lasting power of the citrusy notes is truly outstanding! Hey Robin… since you don’t care for Gentiane Blanche, I’m not surprised you don’t love Narcisse Bleu. However, I consider Gentiane a staple, and have already bought a giant bottle (at discount, to split) of Narcisse. – Narcisse Bleu is a flanker of Gentiane, with a more floral and green character, but still woody and almost bitter in a way that I love. – Mandarine Ambrée I consider a flanker to the Oranges Vertes, and more similar to the Concentré than the Eau. You rightly point out that it probably has elements of Pamplemousse Rose. I do enjoy the vanillic amber that underscores the citrus though. Still, I find it so similar to CdOV — and because there is no dearth of orange scents — that I’m not sure I’d buy Mandarine. It’s definitely well done, though. I love the Hermès aesthetic, so this sort of stealth flanker maneuver doesn’t bother me. It’s sort of the opposite of the common practice of launching flankers that share almost nothing with their parents. I find that interesting, but again, I’m not bothered, though the new, unique names sort of belie the fact that these are fairly unoriginal creations. All good points, and yes, can see the link between OV & MA and even more so between GB & NB. Actually sort of odd to me how MA/PR line up and GB/NB line up…one classic, one modern in each set. I guess it’s sensible to cover all the bases, still. Thank you for your review, Robin. I will sample this one next I time I am out and about. My favorite is Osmanthe Yunnan for summer. I have never found another Hermes scent to top that one. OY is so wonderful. I do wish it was cheaper! I had 100 ml and it’s nearly gone. I hope I get a chance to try these two. In the meantime I was thinking that Sur le Nil pulls off that intriguing trick of proloning the citrus and fruity notes for an unexpectedly long time. It’s winter for me so summer colognes are out of the question right now, but dear me, a shampoo from Avon, no less, strongly reminds me of that citrusy/fruity whoosh of pleasure I get from Nil: Avon Naturals Lime and Green Tea 2-in-1 shampoo and conditioner. Makes me happy. Yes, it really does, and for me, fulfills pretty much the same function as a summer cologne anyway. Wanting to try that amber one, thanks for the review:). I tried these a couple of times now and neither is probably a must own but I thought that both had interesting and likeable opening notes. I liked that Manarine had a touch of slightly bitter zest mixed in with that sweet juiciness although I didn’t adore the drydown. Narcisse was an interesting one although I’m still trying to figure out what other scent it reminds me of. I thought that in had that general JCR-for-Hermès vibe about it so maybe it was just that. Also, when I mentioned that I was a fan of JCE but liked smaller bottles, a Hermès SA told me that there should be some kind of set/coffret of several Hermès perfumes + notes from JCE coming out soon. Oh, very good to know, thanks! I got samples of Eau de Mandarine Ambrée and Eau de Narcisse Bleu. I tried Mandarine and I’m not wowed by it which is uncharacteristic when it comes to Hermes fragrances. I am getting more passion fruit than mandarin and overall, it felt too thin. I have yet to try Eau de Narcisse Bleu on skin and will do so as soon as I find skin time…slim pickings with so many events taking up my weekends and I (almost) never test on a work day as I don’t want to get stuck with something yucky all day. I meant to mention that my Nordstrom has both Eau de Mandarine Ambrée and Eau de Narcisse Bleu in the Men’s fragrance section! Interesting. They do that a lot with unisex stuff — mine even has the Jardins over the men’s side. I was thinking it may be on the thin side, meh. Thanks for your thoughts:). As I said above, Kevin really wasn’t wowed either. He thought they were both dull. Really, Narcisse is so mild that I wouldn’t think it would matter when you tested it. But we know how that works out — if you hate it, it will be like plutonium. Firstly, thanks very much for the kind link. I’m glad this scent is getting some more love. I think it must be difficult to make citrus compositions seem fresh and interesting and Ellena has risen to the challenge well. I have to say I really like Narcisse too, but for totally different reasons. De nada. Agree, it is getting harder & harder given how many brands are doing them. I finally got to try this yesterday. Based on the descriptions, I thought I would like Narcisse Bleu more, but found myself pleasantly surprised by the Mandarine Ambree. Hermes seems to have mastered the bright and cheerful opening.